Scolio-Pilates®, the book, is your guidebook to scoliosis. 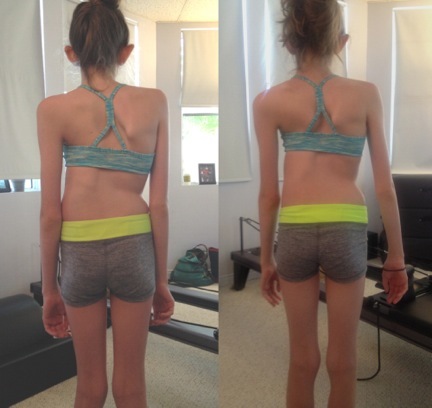 No longer is scoliosis cared for through just observation, bracing and surgery. You can take action and do something today to help yourself. So why is exercise not more widely recognized as an option for scoliosis? Because the right exercises have to be used. If a study looks at exercise in general, no benefit may be found, or worse, the scoliosis may be increased. With the right exercises, studies have shown again and again that exercise is a viable option for handling scoliosis. Many of the Scolio-Pilates® exercises are supported online with free YouTube videos that you can view HERE. Scoliosis is a complicated subject full of twists and turns (literally). Scolio-Pilates® breaks it down into steps. Steps that correct alignment, de-rotate the spine before beginning an exercise, and demonstrate the best exercises to choose for maximum benefit. Part II: Features over 30 thoroughly illustrated exercises. When you study Scolio-Pilates®, you come out knowing what scoliosis is and how its curves manifest. And, you’ve been offered a systematic approach to working toward corrected alignment through creatively supported Pilates exercises. It is very much to Karena Thek Lineback’s credit that the tone of the Scolio-Pilates® is so friendly, the information so well presented, and the visual aids so helpful that it seduces you into sticking with a detailed and complicated subject.